Renee Corrigan teaches a first time home buyers class. The Greater New Orleans Fair Housing Action Center was established in 1995 to eradicate housing discrimination in the Greater New Orleans area through education, investigation and enforcement. The Center is dedicated to fighting housing discrimination not only because it is illegal, but also because it is a divisive force that perpetuates poverty, segregation, ignorance, fear and hatred. “So has anyone heard of steering?” asks Renee Corrigan at a first-time home buyers class she is teaching. “It’s when they steer you toward something they say you should have, in opposition to what you tell them you want,” offers a class participant. “Yeah, cause they’re trying to tell you how to spend your money,” offers another participant. The Fair Housing Act is front and center at every class for first time home buyers given by the New Orleans Fair Housing Action Center. 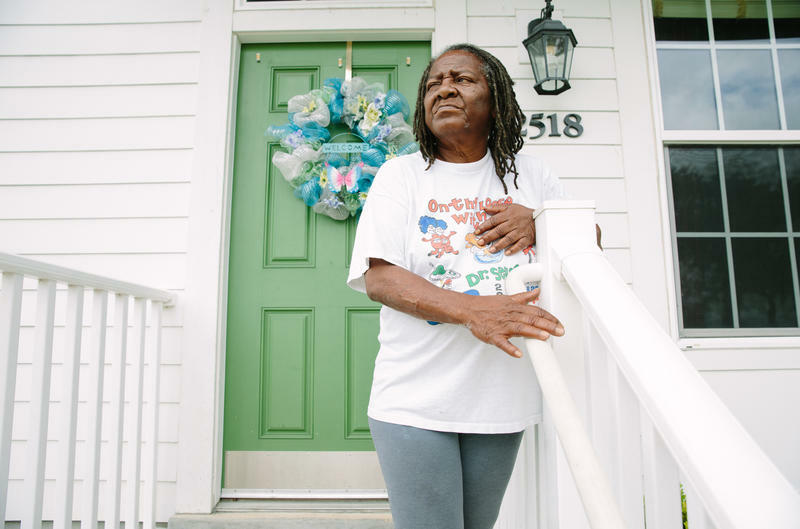 “We do a pretty detailed and thorough comprehensive review of the Fair Housing Act so people can understand the ways in which the Fair Housing laws apply to them and the way that they apply to their journey to becoming home owners,” says Cashauna Hill, the Executive Director of the New Orleans Fair Housing Action Center, whose mission is to eradicate housing discrimination. Back in class, Corrigan passed around fair housing booklets. “If you can take one and send them around,” she asks. Corrigan makes sure her potential home buyers understand what exactly is protected under the 1968 federal Fair Housing Act. Those protected classes include race, color, and national origin. But in spite of this national law, which is almost 50 years old, housing discrimination happens all the time. Which is why the New Orleans Fair Housing Action Center also has an enforcement team. These investigations usually start with a phone call. In 2014, the Fair Housing Action Center conducted a study. They sent white and black testers with similar backgrounds, income levels, and credit scores into New Orleans’ most desirable neighborhoods to look for homes . They found that African American home seekers were discriminated against roughly half the time. That’s right. In 44 percent of their test cases, Black home seekers were getting worse treatment than non-Black home seekers. Housing is the number one way wealth is built in this country. The Fair Housing Action Center wants to make sure that opportunity exists for everyone.